Interest rates are secular. And with interest rates today already hitting the theoretical 0% level – they have started to rise. And when long-term rates begin to rise, (unlike short-term rates) it happens in a snapping, violent manner. Neither of which is good for bond investors. Of course, there’s another important point to consider, the rise in long-rates from 1962 to 1982 occurred when there wasn’t a debt crisis in the developed world. And since 99% of the industry has only worked since 1982 to today, then 99% of the industry has never experienced, lived or even dreamt of a crisis in the bond market. This of course is the primary reason why all the negative stories about the stock market are alive and well played out in the media – they simply don’t know any better. And this is wrong. Very wrong. After all, the bond bubble dwarfs the tech bubble and the housing bubble. Think about it. To grasp why the bond market is on the verge of crisis, and why trillions of Dollars, Euros, Yen and Pounds are about to panic and run away, we ask you to understand how free-markets really work. For starters, all free markets have two sides competing and participating. There are natural buyers and there are natural sellers. The point at which they meet in the middle is the selling/purchase price and the entire process is called price discovery. Price discovery is a wonderful thing. It always results in the determination of a true price for a product or service. However, a big problem arises when there is an imbalance between the buyers and sellers, and when one of the sides isn’t a natural buyer or seller. This is what has happened in the bond market. And this is why bond prices (or yields) have become so distorted; the true price of a bond hasn’t existed now for almost 9 years. [..] over the last year, we’ve seen the most significant market reaction in the history of the bond world, not once but twice. Yet, the talking heads, the big banks and their mutual fund commentaries, and the stock market focused world have completely missed it. Almost a year ago in November immediately after the American Election, over a span of 54 hours – the bond market blew up. To put things into perspective, Chart 2 shows what happened during those fateful days. Ignoring the why’s, the how’s and the who’s – the fact remains that this tiny, miniscule increase in long-term interest rates caused the bond market to vomit over itself. Yes, a +0.7% increase in the US 10-Year Treasury market yield created chaos, havoc and over $1.7 Trillion in losses around the world. There’s a scary little statistic buried beneath the US economy’s apparent stability: Consumer debt levels are now well above those seen before the Great Recession. As of June, US households were more than half a trillion dollars deeper in debt than they were a year earlier, according to the latest figures from the Federal Reserve. Total household debt now totals $12.84 trillion — also, incidentally, around two-thirds of GDP. The proportion of overall debt that was delinquent in the second quarter was steady at 4.8%, but the New York Fed warned over transitions of credit card balances into delinquency, which “ticked up notably.” Here’s the thing: Unlike government debt, which can be rolled over continuously, consumer loans actually need to be paid back. And despite low official interest rates from the Federal Reserve, those often do not trickle down to many financial products like credit cards and small business loans. Michael Lebowitz, co-founder of market analysis firm 720 Global, says the US economy is already dangerously close to the edge. “Most consumers, especially those in the bottom 80%, are tapped out,” he told Business Insider. “They have borrowed about as much as they can. Servicing this debt will act like a wet towel on economic growth for years to come. Until wages can grow faster than our true costs of inflation, this problem will only worsen.” The IMF devotes two chapters of its latest Global Financial Stability Report to the issue of household debt. It finds that, rather intuitively, high debt levels tend to make economic downturns deeper and more prolonged. “Increases in household debt consistently [signal] higher risks when initial debt levels are already high,” the IMF says. Nonetheless, the results indicate that the threshold levels for household debt increases being associated with negative macro outcomes start relatively low, at about 30% of GDP. Clearly, America’s already well past that point. As households become more indebted, the Fund says, future GDP growth and consumption decline and unemployment rises relative to their average values. “Changes in household debt have a positive contemporaneous relationship to real GDP growth and a negative association with future real GDP growth,” the report says. Specifically, the Fund says a 5% increase in household debt to GDP over a three-year period leads to a 1.25% fall in real GDP growth three years into the future. What changed? For one, China’s economy (according to the suspiciously smooth official data, at least) has proven more resilient than expected: The pace of growth has accelerated from a mid-2016 low of 6.7%, and forecasters have raised their projections for 2018. Perhaps more important, Chinese officials have advertised their commitment to controlling debt and containing an overheated property market. That said, it’s odd that banks would think China is getting debt under control even as they provide more of it. Although the accumulation has slowed in some areas, it has boomed in households and elsewhere. By one early-warning measure – the difference between the current and long-term levels of business and household credit as a share of GDP, also known as the credit gap – China and Hong Kong are still by far the riskiest countries tracked by the BIS. As Beijing buys 25% of sales. China’s new home prices registered a second straight month of weak growth in September, with prices in the biggest markets slipping and gains in smaller cities slowing as government measures to cool a long property boom took hold. China’s housing market has been on a near two-year tear, giving the economy a major boost but stirring fears of a property bubble even as authorities work to contain risks from a rapid build-up in debt. While monthly price rises peaked in September 2016 at 2.1% nationwide, they have softened only begrudgingly since then, regaining momentum as buyers shrugged off each new wave of measures to curb speculation. Analysts say more tightening could still be expected in lower-tier cities with relatively fast price gains, as critics argue China’s ever-growing administrative control over its property market has only reaffirmed speculator views that prices will remain steady. “China’s property prices are still rising even as sales are falling off a cliff, which suggests the market still sees property as an investment product in the belief that the government won’t let prices fall,” said Yi Xianrong, a Professor of Economics at Qingdao University. Still, signs of a more stable and less frothy housing market for now will be welcome to the country’s leaders as they attend a critical Communist Party Congress to set political and economic priorities for the next five years. President Xi Jingping opened the twice-a-decade gathering last week, stressing the need to move from high-speed to high-quality growth. Average new home prices rose 0.2% month-on-month in September, the same rate as in August when prices rose at the slowest rate in seven months, according to Reuters calculations from National Bureau of Statistics (NBS) data out on Monday. “The curbs are in general still intensifying, which have gradually impacted property buyers’ expectations,” said Zhang Dawei, an analyst with Centaline, a property agency. New home prices rose 6.3% year-on-year in September, decelerating from August’s 8.3% increase, partly thanks to last September’s high base. Higher prices are also eating up more of home buyers’ disposable income, which could dampen future demand. 1. The Russians didn’t steal the 2016 election. Carter was asked “Did the Russians purloin the election from Hillary?” “I don’t think there’s any evidence that what the Russians did changed enough votes — or any votes,” Carter said. So the hard-left former president doesn’t think the Russians stole the election? Take note, Capitol Hill Democrats. 3. Obama fell far short of his promises. Barack Obama whooshed into office on pledges of delivering “hope and change” to the country, spilt by partisan politics. He didn’t. In fact, he made it worse. “He made some very wonderful statements, in my opinion, when he first got in office, and then he reneged on that,” he said about Obama’s action on the Middle East. Expect more of this. Much more. Two of Italy’s wealthiest northern regions on Sunday voted overwhelmingly in favour of greater autonomy in the latest example of the powerful centrifugal forces reshaping European politics. Voters in the Veneto region that includes Venice and Lombardy, home to Milan, turned out at the high end of expectations to support the principle of more powers being devolved from Rome in votes that took place against the backdrop of the crisis created by Catalonia’s push for independence. Veneto President Luca Zaia hailed the results, which were delayed slightly by a hacker attack, as an institutional “big bang”. But he reiterated that the region’s aspirations were not comparable to the secessionist agenda that has provoked a constitutional crisis in Spain. Turnout was projected at around 58% in Veneto, where support for autonomy is stronger, and just over 40% in Lombardy. The presidents of both regions said more than 95% of voters who had cast ballots had, as expected, done so to support greater autonomy. The votes are not binding but they will give the right-wing leaders of the two regions a strong political mandate when they embark on negotiations with the central government on the devolution of powers and tax revenues from Rome. Secessionist sentiment in Veneto and Lombardy is restricted to fringe groups but analysts see the autonomy drive as reflecting the same cocktail of issues and pressures that resulted in Scotland’s narrowly-defeated independence vote, Britain’s decision to leave the EU and the Catalan crisis. “What this vote has shown is that there is no ‘autonomy party’ in Veneto – what there is is an entire people who back this idea,” said Zaia. “What’s won is the idea that we should be in charge of our own back yard.” Lombardy governor Roberto Maroni said he would be looking to present detailed proposals on devolution within two weeks, in a bid to ensure they are considered before national elections due by May next year. “I will go to Rome and ask for more powers and resources within a framework of national unity,” he said. Embattled commodity trader Noble Group warned of a more than $1 billion third-quarter net loss and agreed to sell most of its oil-liquids unit to Vitol Group at a loss, further complicating its fight for survival. The long-awaited deal to sell its prized oil business provided little relief to Hong Kong-based company, with shares falling the most in three months. Details of the sale announced on Monday failed to give much clarity on how much Noble Group would ultimately receive from Vitol, while the third-quarter results highlighted the company’s struggle to return to profitability as it offloads assets to repay debt. “They’re still fighting to survive,” Nicholas Teo, a trading strategist at KGI Securities said by phone. Noble Group’s stock slumped as much as 12% in Singapore, extending a more than 90% retreat since questions over its financial reporting emerged in early 2015. While the company has defended its accounting, it has also written down the value of its long-term commodity contracts, ousted senior managers and put almost all of its businesses outside Asia up for sale. Noble Group’s 2020 notes are trading at about 39 cents on the dollar, with analysts at BNP Paribas and Nomura predicting that the company will eventually be forced to restructure its debt. Noble Group said that based on its end-June accounts it would have received net proceeds of $582 million from the oil unit deal after paying back borrowings under a secured credit facility. But that figure included proceeds from the earlier sale of its gas-and-power unit, the company said, and was prior to a third quarter in which the business was “adversely impacted” by “capital constraints.” Based on that number, the company would report a $525 million loss on the sale. As US alienates itself from Erdogan. For good reasons. US Treasury Secretary Steven Mnuchin appears set to spearhead initiatives for Greek debt relief as part of Washington’s efforts to bolster Greece as a bastion of stability in the wider region, according to Kathimerini sources. Mnuchin took part in a meeting between US President Donald Trump and Greek Prime Minister Alexis Tsipras at the White House last week that addressed ways to promote investments in Greece, strengthen defense cooperation and push Greek debt relief demands. It was, reportedly, made clear at the meeting that Trump has made a strategic decision to support Greece as a reliable ally in the Eastern Mediterranean. As a first step, the US may ask for an informal meeting of the IMF’s Executive Board to be convened – after a government is formed in Berlin and provided the third Greek bailout review is completed – where pressure will be applied for a specific time frame with regard to Greece’s debt. Another indication that the ball is beginning to roll was the result of talks between Tsipras and IMF chief Christine Lagarde a day before the meeting with Trump. Mnuchin told Trump and Tsipras that Lagarde had contacted him saying her talks with the Greek premier went well and there will be no surprises during the negotiations to complete the review. Mnuchin added that Lagarde said the IMF will push for debt relief. Silvery coho salmon are as much a part of Washington state as its flag. The fish has a sacred place in the diets and rituals of the state’s indigenous peoples, beckons to tourists who flock to watch its migration runs, and helps to sustain a multimillion-dollar Pacific Northwest fishing industry. So watching the species die in agony is distressing: Adult coho have been seen thrashing in shallow fresh waters, males appear disoriented as they swim, and females are often rolled on their backs, their insides still plump with tiny red eggs that will never hatch. “Coho have not done well where a lot of human activity impacts their habitat,” said Nat Scholz, a research zoologist for the National Oceanic and Atmospheric Administration. That’s to say the least. A recent study traced a major coho salmon die-off to contaminants from roads and automobiles — brake dust, oil, fuel, chemical fluids — that hitch a ride on storm water and flow into watersheds. The contaminants are so deadly, they kill the salmon within 24 hours. “Our findings are . . . that contaminants in stormwater runoff from the regional transportation grid likely caused these mortality events. Further, it will be difficult, if not impossible, to reverse historical coho declines without addressing the toxic pollution dimension of freshwater habitats,” said the study, published Wednesday in the journal Ecological Applications. This sort of point-source pollution from antiquated sewer systems is a problem across the nation, including the Chesapeake Bay region. Rain overwhelms storm drains, commingles with human waste and surface road garbage, then flushes into ponds, creeks, streams and rivers. In Seattle and large cities across the Pacific Northwest, those waters are stocked with salmon. The finding could be a breakthrough in a mystery that has vexed scientists for years. But it fell short of explaining another mystery: Why are coho the only one of five salmon species to be affected? Chinook, sockeye, pink and chum don’t remotely experience the same mortality. “This is the great mystery that we are working on,” Scholz said. The future for a species that experiences up to 40 percent mortality before spawning in Puget Sound is no mystery. “The population will crash,” said Jay Davis, an environmental toxicologist for the U.S. Fish and Wildlife Service who coordinated field research for the study. All sea life will be affected because carbon dioxide emissions from modern society are making the oceans more acidic, a major new report will say. The eight-year study from more than 250 scientists finds that infant sea creatures will be especially harmed. This means the number of baby cod growing to adulthood could fall to a quarter or even a 12th of today’s numbers, the researchers suggest. The assessment comes from the BIOACID project, which is led from Germany. A brochure summarising the main outcomes will be presented to climate negotiators at their annual meeting, which this year is taking place in Bonn in November. The Biological Impacts of Ocean Acidification report authors say some creatures may benefit directly from the chemical changes – but even these could still be adversely affected indirectly by shifts in the whole food web. What is more, the research shows that changes through acidification will be made worse by climate change, pollution, coastal development, over-fishing and agricultural fertilisers. Ocean acidification is happening because as CO2 from fossil fuels dissolves in seawater, it produces carbonic acid and this lowers the pH of the water. Since the beginning of the Industrial Revolution, the average pH of global ocean surface waters have fallen from pH 8.2 to 8.1. This represents an increase in acidity of about 26%. The study’s lead author is Prof Ulf Riebesell from the GEOMAR Helmholtz Centre for Ocean Research in Kiel. He is a world authority on the topic and has typically communicated cautiously about the effects of acidification. He told BBC News: “Acidification affects marine life across all groups, although to different degrees. This topic contains 4 replies, has 4 voices, and was last updated by seychelles 1 year, 5 months ago. Jimmy Carter, Hard left? OMG. AE is now ZH lite. Throw just about any crap at the wall and see what sticks. As regards Syria, the USA is proving to the whole world just how they despise Syria’s civilians. Forget about that poor little girl buried in Greece. I am talking about millions of people. “We’re not here forever to fix everything. 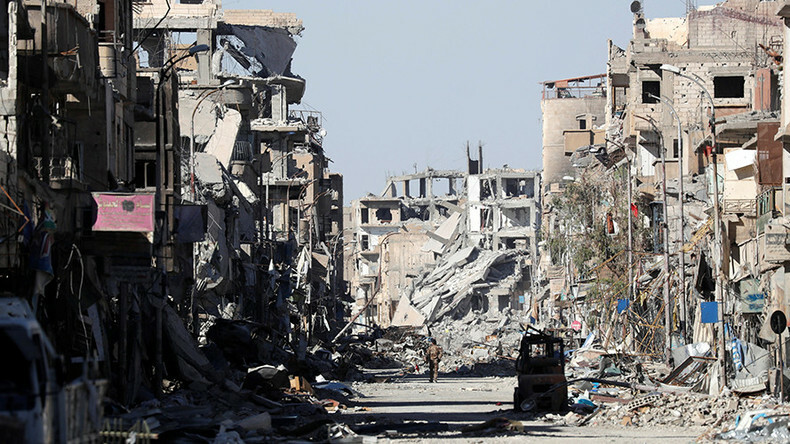 We have no money or desire to spend 20 years here demining the homes,” a US official involved in the civilian operations in Syria told the agency (AFP). A glance at this headline is enough to convince anyone who knows a little chemistry that the BBC is spreading propaganda. The oceans are slightly alkaline. This headline should read: “Less alkaline oceans ‘will affect all sea life'”. But that headline would turn that article into a joke. The second big lie in that article is omitting to mention that the oceans contain 50 times as much CO2 as the atmosphere. There is no possible way that human activity can increase that to 55 times say. Just like the CO2 in a soft drink, the dissolved gas leaves the liquid when the pressure is lowered or the temperature raised. In the case of the oceans, they release CO2 when the climate warms and absorb it when the climate cools – with a delay of hundreds of years. Temperature leads CO2 level – not the other way around. An even better opportunity will arise in the future, with yields on 10 year US treasuries exceeding those in 1982, possibly in the mid-20s, as even sovereign US treasury debt is regarded as high risk. Most of us may not live to see the new peak, but it would be the buy of a lifetime and a wonderful inheritance for our progeny.